I have had a lot of requests for this recipe. I finally managed to find a good recipe from my cousin; Gulzar in Canada. The special ingredient is kiwi, which contains meat tenderizing enzymes. 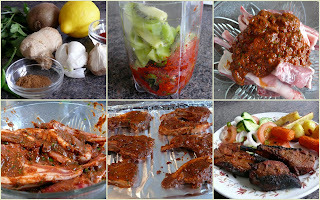 Place all the ingredients (except for the lamb) into a food processor and liquidize. Marinate the meat in this for minimum of 1 hour maximum of 3 hours, otherwise it will become too soft. I served it with roast vegetables and salad. In retrospect the tandoori masala was too overpowering, next time I would half or omit it altogether. Wow mouthwatering here, inviting chops. Thanks Riyaz. Lucky you - Serengeti!